Jean “Isaac” Guindon born and baptized on September 12, 1807 in the parish of St-Benoit in Quebec, a small farming village about 30 miles Northwest of Île Jésus, the island his ancestors originally settled on when first arriving in North America. St-Benoit was first settled in 1780 and originally given the name of Grand-Brûlé. It was subsequently renamed St-Benoit in 1796 after Benoit de Nursie founder of the Benedictine order. Isaac was one of many sons born of Gabriel Guindon and his first wife Anne Rouisse dit Martel. He was also the third child of the couple to be baptized at St-Benoit. The village grew quickly and when Isaac was seventeen in 1824 the population was already over 6000 people, spread over 1082 families. By this time Isaac’s father Gabriel was married to his second wife Madeleine Perrault, after his first wife Anne’s death. He and Madeleine proceed to have a second large family. It appears Gabriel could have fathered at least nineteen children from his two marriages, a large family by any standards. In the 1825 census for Lower Canada Gabriel and Madeleine have a household of 10 persons, unknown if Isaac is living there at the time. 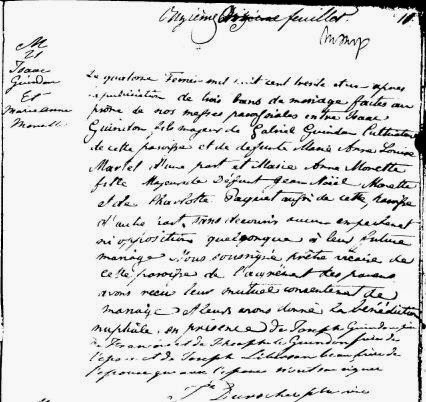 In 1831 Isaac starts his own family with his marriage to Marie-Anne Monette in St-Benoit, Quebec. They had at least three children in St-Benoit in quick succession of their marriage and prior to the Patriots war of 1837, which so devastated their community as well as the neighboring village of St Eustache. From the writings by Jean-Joseph Girouard on the image above we learn that after the battle at St-Eustache on December 14th, 1837 and the subsequent burning of the village. The British troops led by Lieutenant General Sir John Colborne marched towards St-Benoit arriving on the 15th. While the troops expected further skirmishes with the Patriot rebels and villagers. What they encountered were white flags and passive residents. It states the entire village surrendered their arms to the troops as they had been given assurances that if they did so they would be able to prevent the same fate for their village that their neighbors in St-Eustache encountered. It appears the troops and volunteers were of a different mind and the greater part of the village was mostly burnt including 2 churches, 2 presbyteries, a monastery, 4 mills, 111 homes as well as many other buildings. Overall there was much looting, including the theft of livestock and nearly all of the horses from the village. The years of 1837 and 1838 took an overall toll on Lower Canada and its people. Three villages were destroyed, many deaths reported and the departure of many Patriots who fled the country and crossed the border into the United States. Martial Law was implemented earlier in the month of December in Montreal and after support from parties in Upper Canada and even rebel groups from the United States, making skirmishes across the border, Martial Law was declared in all of Lower Canada later in the month. At the conclusion of the troubles there are a number of Guindon’s in the St-Eustache and St-Benoit villages who filed claims and received compensation from the British government for losses incurred during the rebellion. The following Guindon’s received compensation: Celestin Guindon of St-Eustache 3 pounds, Francois Xavier Guindon of St-Eustache 10 pounds 15 shillings, Francois Guindon of St-Eustache 10 pounds 15 shillings and Theophile Guindon of St-Benoit for 5 pounds 19 shillings. They are all likely relations of Isaac. Consequenses of the rebellion were felt for many years in the area including the decline in the population which was dramatic and upwards of 25-30% between the 1832 census and the 1842 census. It is speculated to be connected to the rebellion and the susequent destruction of these villages. With these dramatic events and the hardships encountered before and after the rebellion, including poor crops and epidemic diseases such as Cholera in the area. 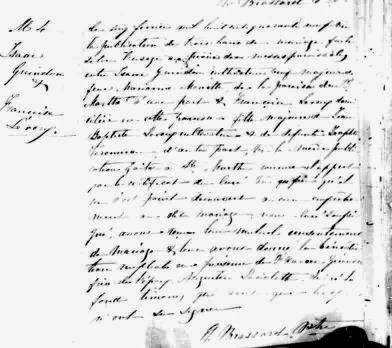 It is not suprising that we would find Isaac and Marie-Anne Guindon moving from the immediate vicinity and find that their next offspring were born in Ste-Madeleine-de-Rigaud and Ste-Marthe, Vaudreuil, Quebec after 1838. Unfortunately Marie-Anne Monette only lived another ten years after their move to the Ste-Marthe, Vaudreuil, Quebec area. Her burial was in 1848 in Ste-Marthe, Quebec, just two weeks after the birth of their ninth child. Sadly her baby died a few weeks later as well. As a widower it was Isaac’s responsibility to provide a mother for his six or seven children at home as well as a companion for himself. A year later Isaac married Francoise Leroux on February 5, 1849 in St-Ignace, Quebec, her family’s parish. With the 1851 census we find that the couple is living in a one story log house and that they have six of his children from his previous marriage to the late Marie-Anne Monette living with them. Isaac and Francoise also have a nine month old baby boy, Joseph and sadly we learn that they lost their two year old daughter Adelle in that year to the flu/grippe. His adult son Olivier age twenty is living there, but absent at the time of the census. At some time between 1851 and 1853 the family moves to North Plantagenet, in the county of Prescott, Ontario a small farming community bordering Ottawa. The Nation River flows through the township and there are a few established mills, serving the lumber industry. Their son Thomas is the first of the children to be born in Ontario in May of 1853 and baptized at St. Luc in Curran, Ontario the previous two children having been born in Ste-Marthe, Vaudreuil, Quebec. 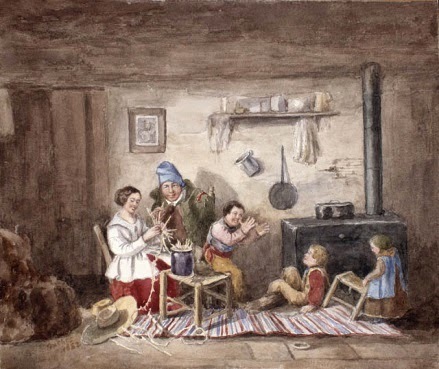 At the time of the 1861 census they are living in another one story log house on a farm with their five youngest children and the two youngest daughters of Isaacs’s marriage with Marie-Anne. The agricultural census of the same year shows that Isaac and his family have 100 acres on a farm with 10 acres under cultivation growing wheat, oats, barley and peas. At least 90 of their acres are wooded. The overall property is valued at 500.00 dollars. 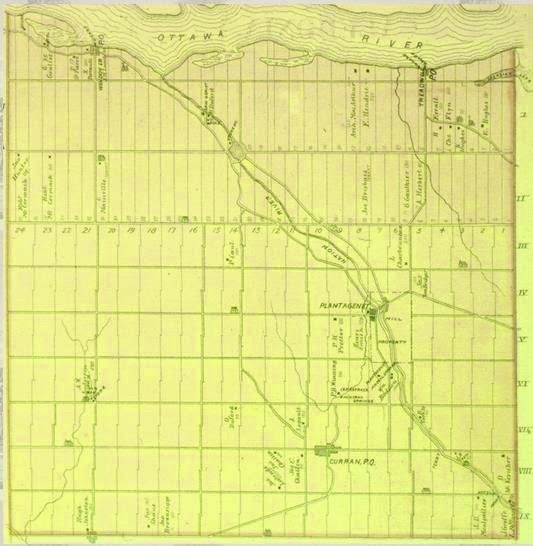 Below is a map of the concessions in the area about twenty years later. Unfortunately the family suffers the death of a mother one more time and in 1862 Isaac’s spouse and Thomas’s mother Francoise passes away at the age of thirty-nine, having just given birth the week before. She leaves behind six children to Isaac’s care. In 1870 Thomas and his siblings are orphaned entirely when their father Isaac dies suddenly at the age of 63. The cause of death is “killed by a tree” when registered in Clarence, Ontario. Curiously, his name is registered as “Isaac Yandon”. You have to wonder was he clearing more acreage on the farm or felling trees for the lumber mills. The burial was at Ste-Felicite in Clarence Creek, Ontario. It is a mystery as to where the orphaned children stayed after the death of their father but luckily we have the marriage records from 1876 of Thomas Guindon to Melina Lamoureux at Ste-Felicite in Clarence Creek, Ontario. She was a local young woman born in Clarence Creek, Ontario. Oral history has the family traveling back and forth between the Clarence-Rockland area and the Ottawa area. This is reflected in the census records of 1881 where Thomas and his young family are enumerated twice, once in Hull, Quebec and again in Rockland, Ontario. In both records Thomas is working as a laborer. Likely they went wherever there was work in the lumber industry. 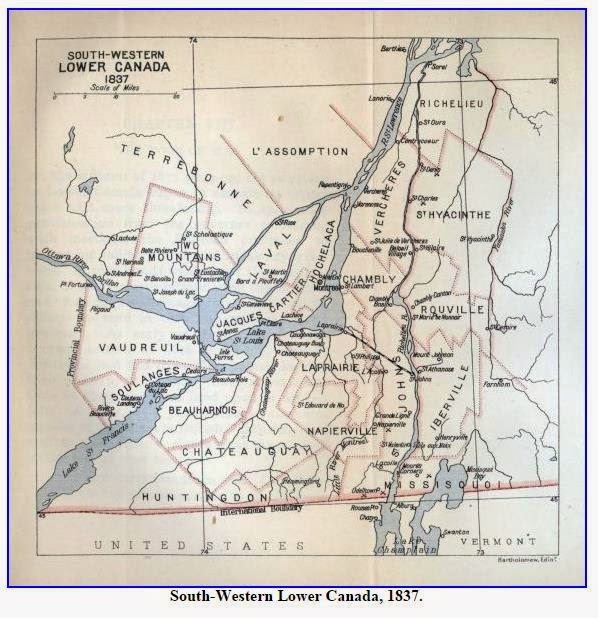 In 1881 Rockland, Ontario has a population of 1,310 people, up considerably from 1871 when it was 350 people. 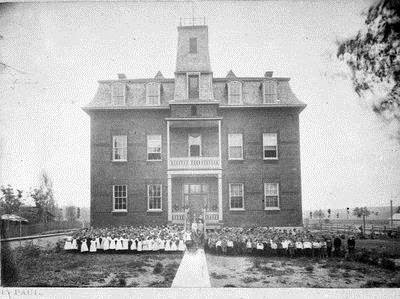 In 1885 Thomas is on the school board of the Sacred Heart Academy a new school that is being built to accommodate the local French and English students under the direction of Father Hudon. By the 1891 census Thomas is listed as a carpenter with a family of seven children at home. Our oral history has Thomas with a small mill shop on his property and making furniture to sell locally. 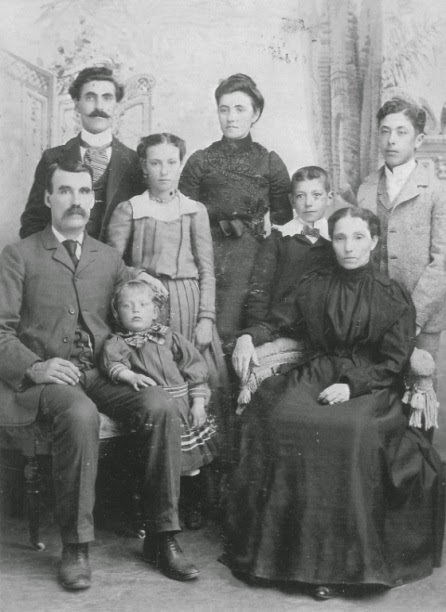 The photo below is likely taken around the turn of the century, 1900 and the Guindon family is listed left to right Felix, Emelia, Ignace, Thomas, Lea, Telesphore, Gedeon and Melina. Name given to Saint-Benoit by early settlers, due to burning stumps and humus, they caused a fire that lasted for at least two years “Saint-Benoît (Québec).” Wikipedia. Wikimedia Foundation, n.d. Web. 01 Apr. 2015. http://fr.wikipedia.org/wiki/Saint-Beno%C3%AEt_%28Qu%C3%A9bec%29. Decelles, Alfred D. “9 FORCE MAJEURE.” The Project Gutenberg EBook of The ‘Patriotes’ of ’37. N.p. : Project Gutenberg, September 13, 2009. 100-01. Print. [EBook #29973]. , Girouard, Jean-Joseph, 1794-1855.Library and Archives Canada, Acc. No. 1984-81-73 Library and Archives Canada, Acc. No. 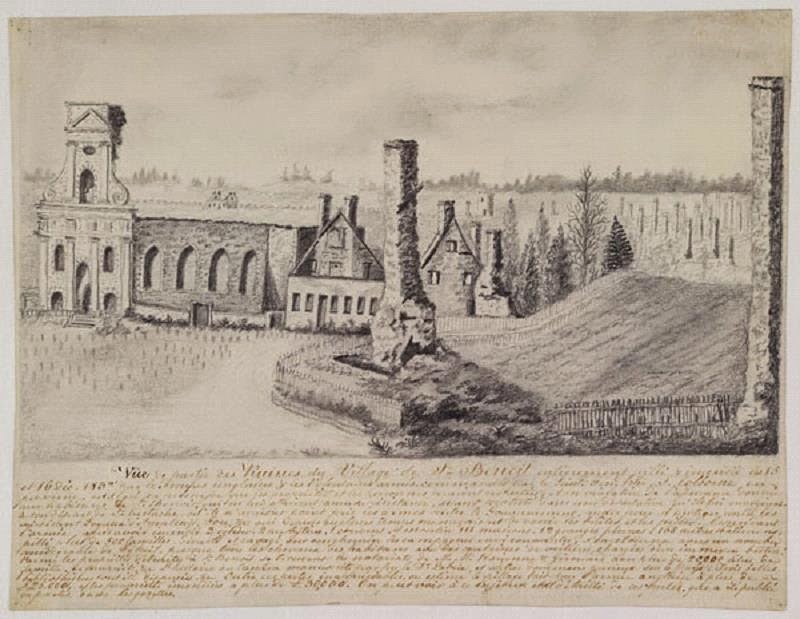 1984-81-73 http://collectionscanada.gc.ca/pam_archives Vue d’une partie des ruines du Village de St. Benoît, Translation from image “View of part of the Village Ruins St Benoit. Belanger, Ann. “Compensation for Losses of the 1837 Rebellion.” Guindon Newsletter 26 (2004): 6. Print. Gagnon, Serge. “Ideology and Quantatative Method.” Quebec and Its Historians: The Twentieth Century. Vol. 2. Ottawa: U of Ottawa, 1985. 133-34. DID YOU KNOW?” Guindon Newsletter 35 (2008): 5. Print.